[MARCH 16-17 | BRYAN, TX] The 2019 Traditions Spring Invitational served as the capstone to the Spring Break season on the TJGT, and more than 90 players from across the state and regional gathered at the Traditions Club in Bryan-College Station to compete for the coveted championship. 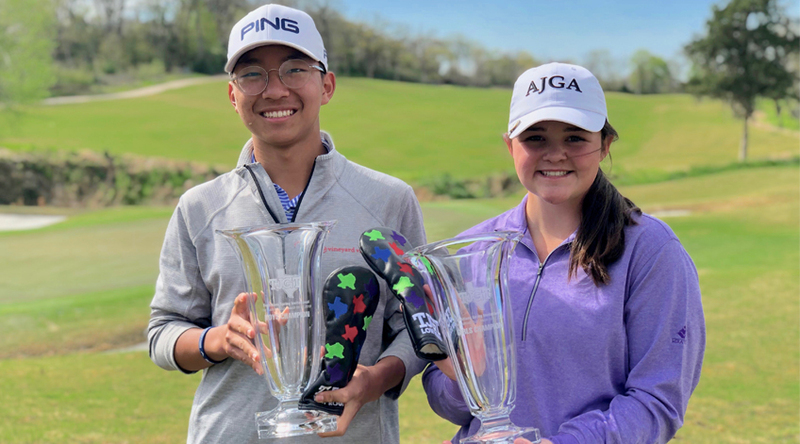 With tight leaderboards all weekend in both the boys and girls divisions, it took under-par rounds from Fort Worth’s Savannah Barber and Westlake’s Daniel Choi on the last day to capture the title. Barber started the final round in a 4-way tie for the lead after opening with a 74 (+2). She made three early bogeys in the round, falling out of the midway through her front 9, but surged back, making four birdies in a seven-hole stretch from No. 7 to No. 13 and vaulting into solo first on the back 9. She played the final five holes in steady fashion, making 5 straight pars to finish her round, carding a 1-under-par 71 and capturing her first invitational victory on the TJGT. Rounding out the Top 3 was Houston’s Denise Pan, who finished in solo second, and Sydney Givens of Austin and Madison Head of Aledo, who finished tied for 3rd. Givens shot even par in the final round, vaulting her up from 10th into the third position. In the boys division, Choi started the final round five shots back of first-round leader Cade Bruce of Longview. And while five shots may not seem like a lot, there were 14 other players ahead of him, making the potential for victory a daunting task. Teeing off almost an hour before the leaders, Choi started steadily, making four straight pars before carding a birdie on the par-5 5th hole. He then birdied holes 8 and 9, as well as the difficult par-4 12th. When he rolled in a birdie putt on the par-5 15th, he took sole possession of the lead and never looked back. His final-round 69 (-3) took him to +1 for the tournament, giving him a 1-shoot victory over Katy’s Byungho Lee. Spicewood junior Hunter McDonough took third place, and three players – Bruce, Cypress’ Tomek Pickrell and Houston’s Jaivir Pande – finished T4. To view the full leaderboard, click here. For photos from the event, view the TJGT Flickr Album.